"The Two of Hearts is often called the Lover's Card, and most Two of Hearts are compelled by the quest for the perfect romantic union. They tend to have several long-term partnerships, and work very hard at each. Often they feel like they have lost or failed at love. Instead, they should look at the experience differently. The Two of Hearts is their assignment and classroom. They are not expected to get it; they are to learn it. Never give up! While they may find their romantic life to be challenging, their careers tend to be filled with success. The majority of the Two of Heart’s hand falls under Mars, which is about tasks fueled by passion and pragmatism. 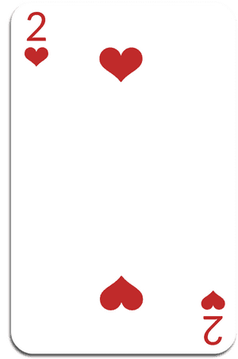 Two of Hearts are constantly connected to people of power and mastery. And they tend to run their own kingdoms with clarity, wisdom and compassion. Lucky for all those involved in the Two of Heart’s endeavors because they make their peeps feel seen and honored.